V Tur-Viñes, P Núñez-Gómez, MJ González-Río (2018): “Kid influencers on YouTube. A space for responsibility”. Revista Latina de Comunicación Social, 73, pp. 1211 to 1230. 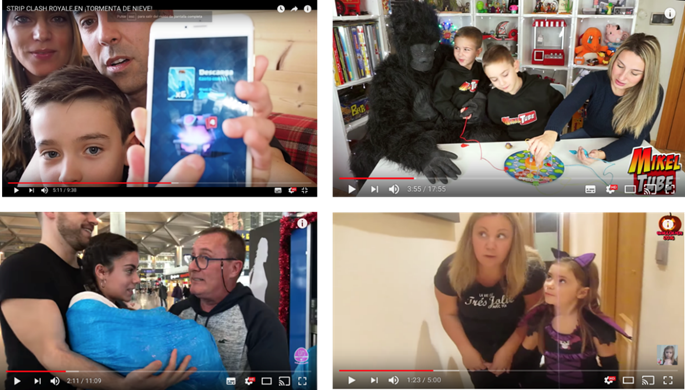 Introduction:This article analyses the practices of kid influencers on YouTube and the presence of brands in the videos they generate. Methods: This is an exploratory study based on content analysis performed on a sample of videos collected from the five most-viewed and most-subscribed YouTube channels starring Spanish children in January 2018. To be precise, we selected the five most-viewed videos from each of the selected channels (a total of 25 videos and 400´). The analysis of the engagement strategies is based on the models developed by McRoberts et al. while the analysis of brand presence is based on the model of Smith et al. Results: There is a common typology in the contents, a semi-professional management style and the simultaneous omnipresence of brands. Conclusions: Recommendations are made for the regulation and management of the communication practices of kid influencers on YouTube to ensure they are developed in a secure, positive, fun and responsible environment. Children; Influencers; YouTube; Brands; User-Generated Content; Collaborative Culture. 1. Introduction. 1.1. Engagement strategies on YouTube channels. The model of McRoberts et al. 1.2. Brand presence on YouTube channels managed by kids. Analytical model of Smith et al. 2. Methods. 3 Results. 3.1. Analysis of brand content. 4. Discussion and conclusions 5. References. The growing consumption of online content by children generates social concern, research interest in the academic field as well as interest in the brands that target them. Education on the proper use of digital audiovisual media and the development of a critical attitude allows children to manage their digital profiles in a competent and safe manner (Celot and Tornero, 2009; Carlsson 2010; Frau-Meigs and Torrent, 2009; Lankshear and Knobel, 2008; Marta-Lazo and Gabelles, 2016). Similarly, research on the spontaneous practices of children on the Internet and the analysis of the influence mechanisms that are triggered, and their consequences, allows brands to implement a responsible communication. YouTube stands as the main video-sharing platform: it has over one billion users, which amounts to almost one-third of the Internet, is localised in 88 countries and can be accessed in 76 different languages (YouTube Press, 2018). Children are active consumers of audiovisual content. Some children have launched their own channels, despite the minimum age required by Google to manage an account is 13 (or 14 depending on the country). Souza Araujo et al. (2017) confirm the incessant presence of children under 13 years on YouTube. Video viewing is now one of the main activities carried out by small children. In fact, children under eight years of age consider the Internet an important source of entertainment (Holloway, Green & Livingstone, 2013; Blackwell et al., 2014). The skills shown by some children to generate content, manage it and create a community of followers has aroused the interest of those brands that wish to communicate empathically. The phenomenon of kid YouTubers is fascinating as a source of innovation of contents and space to test new and fresh communication styles, which are not always identified as advertising spaces but almost always have a persuasive character. YouTube has allowed small children to become content creators, producers and disseminators through their mobile phones. Influencers and vloggers provide entertainment and advice to young people, but this phenomenon has also generated urgent regulatory implications and the need for guidance for brands’ safe and strategic action. From the perspective of the participatory culture (Jenkins, 2009), the activity of children in YouTube is based on the ease of access and fluid exchange of content between professionals and amateurs. In addition, it is characterised by certain civic commitment with different degrees of participation in the current public life (Checkoway and Gutiérrez, 2009). Content designed for this purpose have a fun and subversive tone with high doses of artistic editing (Muñoz, 2012, p. 55). The activities that children develop on YouTube reflect important aspects that have a scattered legal regulation: the consideration of children as broadcasters, the questionable, or otherwise, support of their legal guardians, the presence of brands, the blurring of the advertising intention, the massive numbers of followers, the undeniable influence of these practices in the current audiovisual generation and their unstoppable upward trend (Chester, 2015; García, Campbell & Null, 2015; Craig & Cunningham, 2017; Campbell, 2016; Blades, Oates & Li, 2013; Burgess, 2012). Thus, regulation faces the challenge of ensuring the necessary protection of children and, at the same time, recognising the value of new practices. Today’s children have been born in a digital environment and use technology that gives them access to such environment as a natural extension of themselves. They use technology for almost everything, especially to express themselves, collaborate, showcase themselves, share their creations, meet people, be entertained, study, and keep up with everything related to their interests. With this profile, the relationship of children with brands is different from that of other generations. Children get in touch with brands when they want to get involved and contribute. YouTube is the quasi-perfect platform to do so. YouTubers, as prosumers (Toffler, 1981; Islas, Arribas and Gutiérrez, 2018), often choose the themes of their videos and listen to the opinion of their followers, building a partnership model of reference for other social networks that want to emulate the same effects. However, a large number of followers is not synonymous with quality as it has been shown by the revelation of cases of fake followers for sale (Izea, 2018). This situation highlights the need for global and effective regulation that brings some order to influence-based communication and social media. User Generated Content (UGC) is currently experiencing an important growth, parallel to the social rise of the need for online expression and conversation (Boyd & Ellison 2008). As Aristotle (2000) has pointed out, the person is a social being by nature and these amateur contents meet their needs of sociability. For the philosopher, people enjoy individual dimensions where they develop their personality and their being, but this dimension is immersed in a wider social dimension that wraps the previous dimensions and allows them to live in community and develop their coexistence. Centuries later, Aristotle’s ideas are still relevant. Children mostly use YouTube as a tool for identity projection, as an expression of their way of seeing life. However, the use of YouTube’s social interaction tools does not reveal that interaction is a key factor, which questions the social character that sometimes is given to the platform, as Gallardo-Camacho and Jorge-Alonso (2010) and Gallardo-Camacho (2013) have shown. UGC is genuinely creative and versatile. Influential videos, which are often tutorials, product reviews and entertainment, are a form of paid advertising. However, the boundaries between non-advertising and advertising contents are blurred on YouTube and may mislead children on their final intention. Children under eight years of age have difficulty to identify online advertising compared to traditional TV advertising (Kunkel & Castonguay, 2012; Panic, Cauberghe & Pelsmacker, 2013; Blades, Oates & Li, 2013). Influence-based communication is more effective than traditional ads because its design seems to be “real”, “non-advertising” content and is, therefore, more credible. These circumstances are worth researching because children are vulnerable as broadcasters and audience. On the other hand, Dantas and Godoy (2016: 98) claim that, in some cases, kid channels can be considered a quasi-professional activity conditioned to the commercial interests of the brands that sponsor them. From this perspective, they suggest some problems for young video-creators, such as their labour exploitation by adults. The activity of YouTubers has professional aspects, requires a planned schedule, the obligation of promoting the products provided by brands, the constant originality of contents and the post-production and editing work, among others (Marôpo et al., 2017). Having identified the phenomenon of kid influencers in YouTube and exposed the reasons that make it relevant, current and interesting from the point of view of communication, the main objective of this text is identify the practices of young Spanish-speaking influencers on YouTube and the support they receive from brands. To do this, we will examine the persuasive strategies aimed at the creation of communities of followers derived from their channels on YouTube and the presence of brands on these channels. We will use two models of content analysis that have been used in previous research and are described below. 1.1. Engagement strategies on YouTube channels. The model of McRoberts et al. In order to understand the opportunities offered by the appropriation of technology for the empowerment of children in their role as digital narrators on YouTube, Mc. Roberts et al. (2016) conducted a research with a sample of 100 YouTube channels managed by content-creating children and the most-viewed 40 channels with professional quality. Based on this study, these authors proposed a model to study the narrative practices of children and the participation that is generated with the audience, in comparison with the practices of adults; to identify strategies to increase viewer participation and interaction (engagement) with videos and to classify the videos’ quality (amateur or professional) and content. The study was based on the open source code of the selected professional videos. The model includes five indicators that group together different variables. 1. Indicators to promote and encourage viewer engagement: this investigates the ways in which YouTubers encourage their audience to interact more with a video or the whole channel (for example, “Subscribe!”); whether they promote their own brand on other sites and channels; whether they suggest other people or brands to sponsor content or channels; whether they offer physical or digital gifts to viewers in order to build loyalty and whether they ask directly the audience or potential brands for money. 2. Indicators to analyse the type of interaction that YouTubers establish with their audience: includes actions and strategies related to the recognition of the channel or its protagonist that contribute to the creation of a differentiated brand: whether the author thanks viewers for watching or acknowledges the presence of viewers; whether the author mentions a video’s number of views or subscribers, or their increase; the direct request for comments or opinions; shout-outs to specific viewers; drawing attention to specific elements of the designed contents; or the absence of all previous strategies, which would reveal a lack of commitment with the channel’s audience. 3. Indicators of speaking styles: examines the existence of unscripted talking style; the identification of a conversational script or very polished talking; the prevalence of a shouty style; or the presence of an eccentric speaking style, using strange sounds or voices; the absence of speaking or written text in the video; the use of specific branded phrases used as intro/outro in all videos; the presence of parents talking about brands. 4. Indicators of editing complexity that allow us to classify contents into three levels of editing: low, which refers to very basic cutting; medium, which involves extra details in cuts and graphics; and high, which involves movie or television quality editing as well as custom animation graphics. 5. Indicators of intro or outro slide usage. It is divided into three types: fancy (custom animated intro or outro clip on videos); some (presence of intro and outro slide or clip for videos) and none (no intro or outro slide for any videos). The previous proposal is quite comprehensive to study the typology of videos offered on YouTube, as it allows us to differentiate them, identify the relevant aspects that distinguish the contents that generate greater interaction and the keys to understand the technological and communicative competence of children. In addition, it enables the comparison as it is an analytical model whose validity has been sufficiently demonstrated in previous studies. Therefore, we consider it to be a useful model for our study. 1.2. Brand presence on YouTube channels managed by kids. Analytical model of Smith et al. Based on the content analysis of 600 works generated by users in the field of fashion, Smith et al. (2012) propose a model to analyse the presence of brands on YouTube channels. 1. Brand co-exists with the channel’s promotional self-presentation, which is carried out by the consumer to express a specific image and identity. To do this, the author relies on brands, objects, products and symbols that help building the desired meaning. Self-presentation is a strategy for the promotion of the personal channel to make it unavoidably recognisable. 2. Brand centrality. This dimension examines whether the brand has a central role (brand is the focus) or peripheral role (presence of support) within UGC. 3. Multiplicity of brands. It refers to how many brands coexist in the UGC and how many are displayed or mentioned. The joint presence of several brands can express a constellation of symbolically related products that help to build or manifest a social role or to express other less symbolic relations. 4. Marketer-directed communication. In this type of content, often generated in the official channels of the brands, consumers can easily communicate with the advertised brand. These spaces function as customer service channels, and consumers can ask questions or make complaints to marketing specialists, as well as to respond to questions or comments from the company. 5. Response to online marketer action. In this case, content is generated by the consumer to respond to offline or online marketer actions. This variable aims to determine whether a brand-related UGC is or not a response to a specific marketer action such as asking questions to consumers and publish coupons, or the launch of new products and advertising campaigns. 6. Factual information about the brand. This dimension serves to assess whether factual information is presented about the brand in UGC. Brands may be mentioned for many reasons: symbolism, as a focus of opinions or complaints, or as objects of interest. Users of social networks can also make references to brands while they share information about them. Objectively verifiable elements, for example in the case of fashion brands, can be, among others: colour or style of a specific clothing item, a price, the location of a shop, etc. 7. Brand sentiment. This last dimension considers the type of sentiment (positive, neutral, unclear, negative) that the UGC conveys towards the brand. It is a revealing indicator that marketing professionals should consider when evaluating the success of campaigns in social media. To complete the analysis, we have taken into account the presence or absence of parents during the video and the way they interact during the presentation. The model of Smith et al. (2012) provides a general framework for understanding how communications produced by users influence the communication strategies of brands, and feed and contribute to the spontaneous and uncontrolled social conversation about them. Ensuring YouTube is a secure, enriching and entertaining environment for children is an inescapable social challenge. Research on these issues is needed to ensure responsible communication practices and to provide guidance for everyone involved in this phenomenon. As mentioned, the main objective is to identify the practices of young Spanish-speaking influencers on YouTube and the presence of brands on their contents. To do this, we will pay attention to the persuasive strategies directed to the creation of communities of followers for their channels. This study is exploratory and is an initial approach to our object of study through content analysis based on the previous indicators taken from the selected analytical models. The model of McRoberts et al. (2016) is used --with its five indicators-- for the analysis of the engagement strategies of the YouTube channels of children and the analytical model of Smith et al. (2012) -with its seven indicators- is used for the study of brand presence. The following research questions have been formulated: Are there any common elements in the strategic management of the YouTube channels of children, with a high number of subscribers? What formats do the presence of brands adopt on these channels? And what is the role of the minor in advertising? The sample of channels was chosen with the help of the SocialBlade database. The selected criteria led to the selection of the 5 most-viewed and most-subscribed Spanish channels tarred by children. The study was conducted throughout January 2018. For the sample, we selected the 5 most-viewed videos from each of these YouTube channels, to form a final sample of 25 videos. Each video lasts approximately 10 to 15 minutes so 400 minutes of video were analysed. The channels included in the sample are described below. La diversión de Martina (“Martina’s fun”): the protagonist of this channel is Martina, a 13-year-old girl with 2.1 million subscribers and 488,254,369 views. The channel was launched on 1 May 2015 and today has a sister channel called Martina Musicaly, which has 273,000 subscribers. The videos offered in the main channel are varied: toy unboxings, room tours, challenges, tips, activities with fans, travel, shopping etc. Los juguetes de Arantxa (“Arantxa’s toys”): Arantxa is only six years old. She launched the channel on 2 January 2015 with the help of her parents, Angel and Maricel. It currently has 1.5 million subscribers and 610,241,407 views. Together with her parents, Arantxa has opened two more channels, Family Fun Vlogs and Arantxa Games and has created branded products of her own. The main channel presents videos with contents such as toy unboxing, challenges, food from other countries, sketches, vlogs and interviews, etc. MikelTube:The protagonists of this children’s channel are two brothers from Sant Adria: Mikel and Leo, aged 8 and 4. On 30 August 2015, they opened this YouTube channel. The content of the videos includes toy unboxing, cards, surprise envelopes, chocolate eggs, visits to theme parks and much more. Despite being so young, they have attracted 1.2 million subscribers and 743,204,689 views. Los mundos de Nico (“Nico’s worlds”): The channel was lunched on 4 November 2013 by Nico, an 8-year-old kid from Barcelona. To date, the channel has 600,000 subscribers, 123,021,951 views, and a sister channel called Los Gameplays de Nico, which has 88,000 subscribers. The content of the videos that we can find in Nico’s main channel is quite varied: toy unboxing, cards, challenges in family, travel in family etc. Juguetes MaryVer (“MaryVer toys”): This channel was launched on 9 June 2010 by Irene and her brothers Felix, Pedro and Mateo. Although the protagonist of virtually all of the videos is Irene, she is often accompanied by her brothers. The content of the videos is quite varied: challenges, videogames, vlogs of fun trips, toy unboxings, etc. This 9-year-old girl has achieved 184,000 subscribers, 66,178,125 views, and two sister channels: Irene entretiene and MaryVer Gamer. The results of the analysis are presented in tables created for each of the indicators that comprise the models used. The data from the five videos taken from each channel are grouped due to space limitations and to facilitate compression of readers. Wherever possible (Tables 2 and 5), we recoded the qualitative variables, attributing them a numerical value. The selected channels suggest actions to promote viewers’ participation (see table 1). As a strategy to promote engagement, all channels directly request audience participation through subscription, like and the sharing of video on other social networks. All of them have interconnections with similar channels managed by children with which they seem to have some partnership, either by sharing content, or doing video collaborations. In the collaborating channels there is a coincidence between the advertised brands whose presence is simultaneous in all of them. La diversión de Martina and Los Mundos de Nico offer prizes and contests to encourage their viewers. These prizes can be digital prizes, such as shout-outs by YouTubers to users. Table 1. Indicators to promote and encourage viewers’ participation. Promotes other kids’ channels and brands. Source: Authors’ adaptation of the model of McRoberts et al. (2016). Figure 1. Examples of contests in the selected channels. Table 2 groups together in a single dichotomous category (1 Yes and 2 No) the four variables proposed in the model of McRoberts et al. (2016) to promote viewers’ participation. The results reveal that all channels encourage viewers’ participation. Los mundos de Nico (80%) and MikelTube (75%) are well above the average. Table 2. Promotion of viewers’ participation by channels. With regards to the type of interaction of the channel’s child presenter with the audience (see table 3), we can highlight the use, in all of them, of an intro phrase, a corporate channel phrase, which is invariably repeated. In general, there is always a voice of gratitude to fans for watching the channel and three of them allude to specific people. The participation of parents is continuous in four of the five channels (see image 2), in one of them this participation is very active: they support with their presence and voice the use of the product and provide information about where to buy the product. Table 3. Indicators to analyse the type of interaction. Figure 2. Images of presence of parents. The speaking style (see table 4) is emphatic and when brands are mentioned the voice is raised, producing an artificial effect, unnatural, and an overt loss of spontaneity. Volume goes even more up in three channels when sing sound effects (canned laughter) or weird voices. Table 4. Indicators to analyse speaking styles. Although the model of McRoberts et al. (2016) establishes three levels to classify the editing complexity of content (low, medium and high), table 5 only presents two complexity levels since none of the analysed channels had a medium level. As we can see in table 5, the editing complexity of the contents is low in most cases, producing a more natural effect that is closer to viewers, except in MikelTube, which is more professional. Table 5. Indicators of editing complexity. Finally, the model followed to analyse the narrative practices of children establishes three types of indicators of contents’ intro and outro. All channels used customised and animated intro and outro clips (see table 6). Table 6. Indicators of intro and outro slide usage. With regards to the brand content variable (see table 7), all children introduced various brands in the videos, except for Juguetes MaryVer, who only presents one product. The rest of channels advertise one or two products but have others displayed (brand placement) on shelves or in different parts of the video. Youtubers use these products and show all of their features and mention the stores that provided them with those products; they show the websites and products related to the brand, such as films and other merchandising. Table 7. Brand presence on children’s YouTube channels. Source: Authors’ own creation based on the model of Smith et al. (2012). Product reviews are always positive, as they explain the different ways to use the products and describe their features. In addition, they offer information about the different products of the brand, display and test them. Advertising is present throughout the video with direct calls to consumption through terms such as “buy”, “get” and toy reviews. Children who manage the selected channels convey a natural attitude to get more subscribers and gain popularity. Their time revolves around brands. The purpose of this work was to identify the practices carried out by young YouTubers, who are able to personally manage their channels, create communities of followers and become authentic influencers, to the point of attracting the interest of brands who see in them an opportunity to communicate with their potential clients. Based on this general objective, we formulated the following research questions: are there any common elements in the strategic management of the most-viewed YouTube channels managed by children? What formats do the presence of brands adopt on these channels? And what role does the child play in advertising? The analysis allows us to assert that there are common elements in the strategic management of the selected YouTube channels. Most of them are dedicated to games, product stories, toy unboxing, challenges and tutorials. All of them encourage viewer participation similarly, by inviting viewers to subscribe to the channel, share their content on social networks and participate in contests to win prizes and gifts. Similarly, there is a remarkable coincidence in the tactics used by YouTubers to communicate with their followers: resorting to fixed intro phrases (“Hi kids, welcome to my channel. Los Juguetes de Arantxa, Arantxa is here”) as well as outro phrases (“Goodbye little friends, goodbye, goodbye”). They also used brand images that facilitate the recognition of the channel and contribute to the creation of their own brand and their differentiation from the rest. The analysis reveals significant differences in the speaking styles used by YouTubers. While some influencers (La diversión de Martina and Los juguetes de Arantxa) use a conversational script or very polished talking, the other channels (MikelTube, Los mundos de Nico and Juguetes MaryVer) use an unscripted talking style. However, all channels use an emphatic and overacted language especially when talking about brands. Other common features are low editing complexity, very basic editing work, with the exception of MikelTube, which presents a higher level of editing complexity that involves several cameras, different shots and post production sound. The analysis of the presence of brands on channels also yields similar results. Products and brands are advertised directly on the channel, are present in different parts of the sceneand are shown through different shots. YouTubers provide information on products’ usefulness, demonstrate their use and associate them with positive emotions, turning them into aspirational objects of desire. Partner channels show similarities in terms of the advertised brands, whose presence is simultaneous in all of them. This could be explained by a joint advertising management by the same multi-channel network for a communicative action of the same products across different channels. It seems to be a clear indication of the presence of a management strategy that aims to monetise these channels. On the other hand, it is interesting to note that the advertised products continue to be the same classics of traditional advertising for boys and girls. New products were not detected. Content updates and chronology suggest quasi-professional planning of the channel to the detriment of the expected amateur character. This planning can exert pressure to comply with a “work” plan. Some YouTubers upload up to seven videos per week. This planning manifests a clear loss of spontaneity that suggests a trend towards professionalisation to monetise channels as much as possible based on the training of the school-aged protagonist. Attempts to monetise the channel distort the so-called spontaneous talent of children in an area of extensive experimentation for advertising. It is important to note that the collected data in no way aims to provide statistical representativeness. As mentioned, this is an exploratory research study and the results have to be interpreted from this perspective. It seems clear that the selected group of influencers differs from others, which would lead us to carry out a more in-depth study that would include more channels and more brand-related variables, such as duration of brand presence in the video, shots used to highlight the product, presence of advertising content, used words, covert advertising techniques, parental support in the production of the video, among others. The environment in which videos are produced, their narrative styles, language types, offline activities and the attitudes of creators and viewers must be taken into account in future research. Risks emerge from children’s proven difficulty to identify the advertising intention, the absence of warnings in this regard caused by unclear regulation and viewers’ perception of the commercial communications made by YouTubers as authentic, based on mechanisms of trust and interpersonal influence. The phenomenon of the kid influencers in YouTube has generated urgent regulatory implications and the need for guidance for brands’ safe and strategic actions. In short, it is essential to implement effective and global regulation/self-regulation guidelines to bring order to influence-based communication and social media, overcoming geographical barriers. *Research project funded by the Ministry of Economy, Industry and Competitiveness of Spain (2014), as part of the National R&D Programme: “Challenges of society” (Ref. CSO2014-56250-R). Trans-alphabet. Teens’ transmedia competencies and informal learning strategies. Participating entities: Pompeu Fabra University, University of Alicante, University of La Coruña, University of Cordoba and National Distance Learning University. Directed by Carlos Scolari. Aristóteles (2000). Política. Madrid: Alianza editorial. Blackwell, C. K., Lauricella, A. R., Conway, A., & Wartella, E. (2014). Children and the internet: Developmental implications of web site preferences among 8-to 12-year-old children. Journal of Broadcasting & Electronic Media, 58(1), 1-20. Blades, M., Oates, C., & Li, S. (2013). “Children’s recognition of advertisements on television and on Web pages”. Appetite, 62, pp.190-193. Boyd, D.M., & Ellison, N.B. (2008). “Social Network Sites: Definition, History and Scholarship”. Journal of Computer‐Mediated Communication, 13(1), pp. 210-230. Burgess, J. (2012). “YouTube and the formalisation of amateur media”. In Hunter, D. Lobato, Richardson, R. M. & Thomas, J. (Eds.) Amateur Media: Social, Cultural and Legal Perspectives, Oxon: Routledge, pp. 53-58. Carlsson, U. (2010). Children and Youth in the Digital Media Culture. From a Nordic Horizon. Yearbook 2010 from the International Clearinghouse on Children, Youth and Media. Gothenburg: Nordicom. Checkoway, B.N.& Gutiérrez, L. M. (Eds.) (2009): Teoría y práctica de la participación juvenil y el cambio comunitario. Barcelona: Graò. Dantas, T. & Godoy, R. (2016): “YouTubers mirins: mera expressão artística ou trabalho infantil?”. In Comitê Gestor da Internet no Brasil. Pesquisa sobre o uso da internet por crianças e adolescentes no Brasil. TIC Kids online Brasil 2015, pp. 95-104. Frau-Meigs, D. & Torrent, J. (2009): Mapping Media Education Policies in the World: Visions, Programmes and Challenges. New York: United Nations Alliance of Civilizations and Grupo Comunicar. Holloway D. Green, L. & Livingstone, S. (2013): Zero to eight: Young children and their internet use. Retrieved from http://eprints.lse.ac.uk/52630/1/Zero_to_eight.pdf. Jenkins, H. (2009): Fans, blogueros y videojuegos: la cultura de la colaboración (Vol. 180). Barcelona: Paidós Comunicación. Kunkel, D. & Castonguay, J. (2012): “Children and advertising: Content, comprehension, and consequences”. In Singer D.G. & Singer, J.L. (Eds.) Handbook of Children and the Media, Los Angeles: Sage, pp.395-418. Lankshear, C. & Knobel, M. (2008): “Digital Literacies – Concepts, Policies and Practices”. In Lankshear, C. & Knobel, M. (Eds) Digital Literacies: Concepts, Policies and Practices, New York: Peter Lang. Marôpo, L., Vitorino Sampaio, I. & de Miranda, N. P. (2017): “Top Girls on YouTube. Identity, Participation, and Consumption”. In Eleá, I. & Mikos, L. (Eds.) Young & Creative. Digital Technologies Empowering Children in Everyday Life. Gothenburg: Nordicom. Marta-Lazo, C., & Gabelas Barroso, J. A. (2016): Comunicación digital: un modelo basado en el Factor R-elacional. Barcelona: Editorial UOC. Muñoz, S. M. (2012): “Televisión y respuesta de la audiencia: Youtube, los comentarios como medio de evaluación y sus límites”. TecCom Studies: Estudios de Tecnología y Comunicación, 4, pp. 342-348. Panic, K., Cauberghe, V. & Pelsmacker, P. (2013): “Comparing TV ads and advergames targeting children: the impact of persuasion knowledge on behavioral responses”. Journal of Advertising, 42(2-3), pp.264-273. Smith, A., Fischer, E. & Yongjia, C. (2012): “How does Brand-related user-generated content differ across YouTube, Facebook and Twitter”. Journal of Interactive advertising, 26(2), pp.102-113. Toffler, A. (1981): La tercera ola. Barcelona: Plaza y Janés. Tur-Viñes, V. (2015): “Engagement, audiencia y ficción”. In R. Rodríguez-Ferrándiz, R. & Tur-Viñes, V. (Coords.) Narraciones sin fronteras. Transmedia storytelling en la ficción, la información, el documental y el activismo social y político. Cuadernos Artesanos de Comunicación, 81, Tenerife: Sociedad Latina de Comunicación Social, pp. 41-60. V Tur-Viñes, P Núñez-Gómez, M J González-Río (2018): “Kid influencers on YouTube. A space for responsibility”. Revista Latina de Comunicación Social, 73, pp. 1211 to 1230. Article received on 12 April 2018. Accepted on 14 June. Published on 28 June 2018.